Easy Walk to Downtown and the Beach! Welcome to Avrio by the Sea! Home sleeps 8 adults and 2 small children. Enjoy the Carmel lifestyle indoors or out at this hidden gem in one of the world’s premiere vacation destinations, where guests can enjoy the ambiance from the homes’s two beautifully landscaped patios and from inside a one-of-a-kind home that blends contemporary and vintage elements. 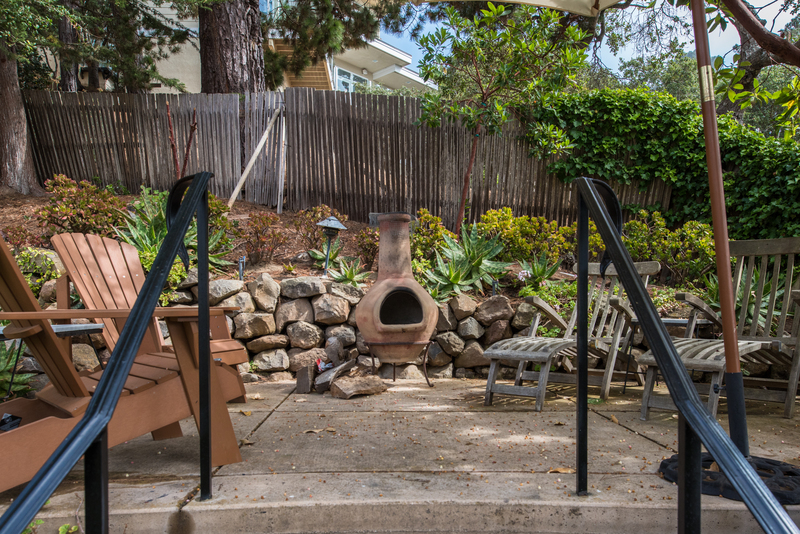 The upper patio has a clay chiminea wood stove and outdoor seating to watch sunsets or stars. The home, designed by John Thodos, an award-winning architect known for mixing minimalism with Mediterranean openness and light, is at the end of a very private cul de sac just a 10-minute walk from downtown Carmel-by-the-Sea. 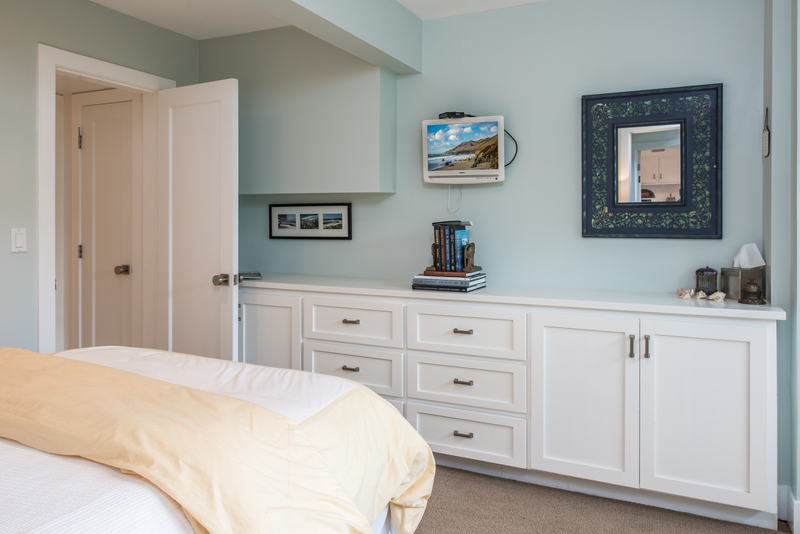 Two of the bedroom suites and the family room have private entrances, adding convenience for couples who want to enjoy nightlife and fine dining in Carmel. 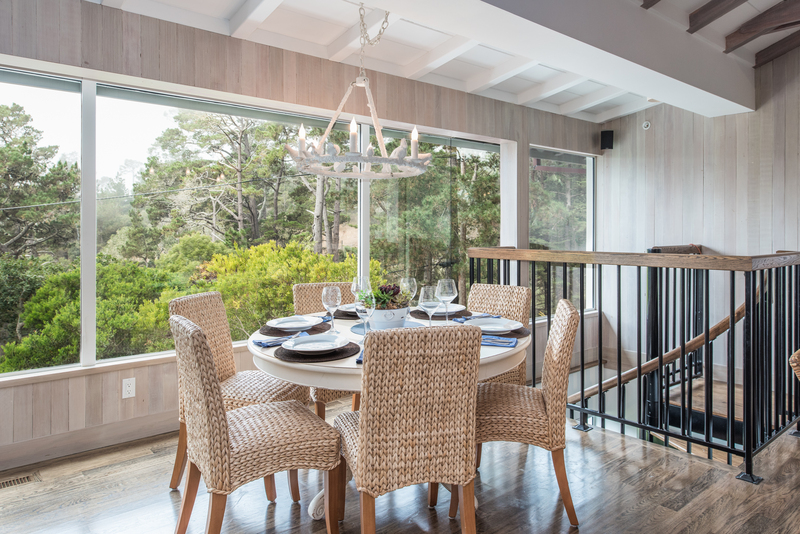 Distant ocean views through the treetops can be seen from the upper floor through large picture windows. 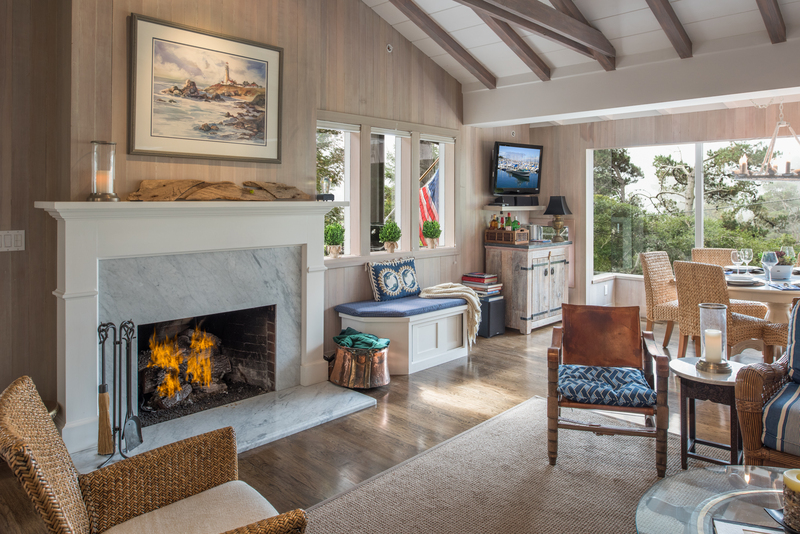 The comfortable décor mixes contemporary furnishings with vintage nautical items, such as an antique diver’s helmet and a coffee table made from a ship’s wheel, with a sophisticated color scheme in tones of blue, cream, and brown. 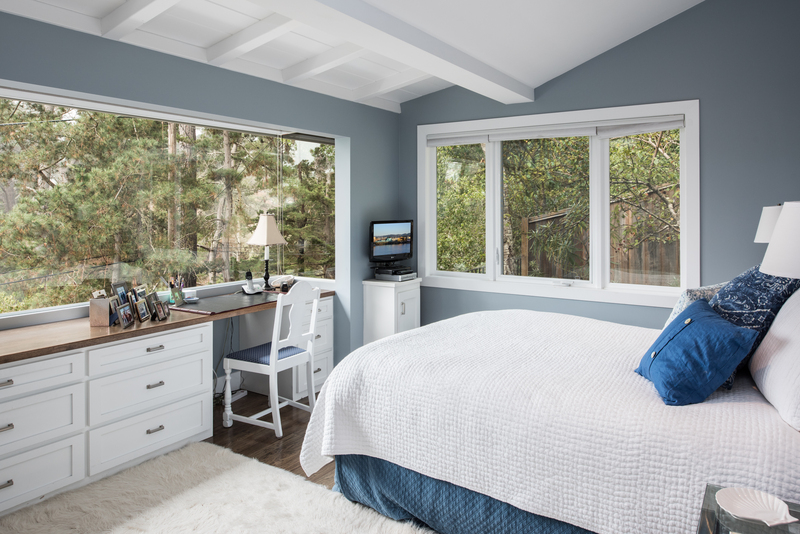 The home is walking distance to downtown Carmel and a 5 minute walk to the beach as well as just 10 minutes by car from golf and dining in Pebble Beach, or from Pacific Grove’s famed butterfly trees. It’s also just 10 minutes from the Monterey Bay Aquarium and Cannery Row, or a half-hour from the natural wonders of Big Sur. 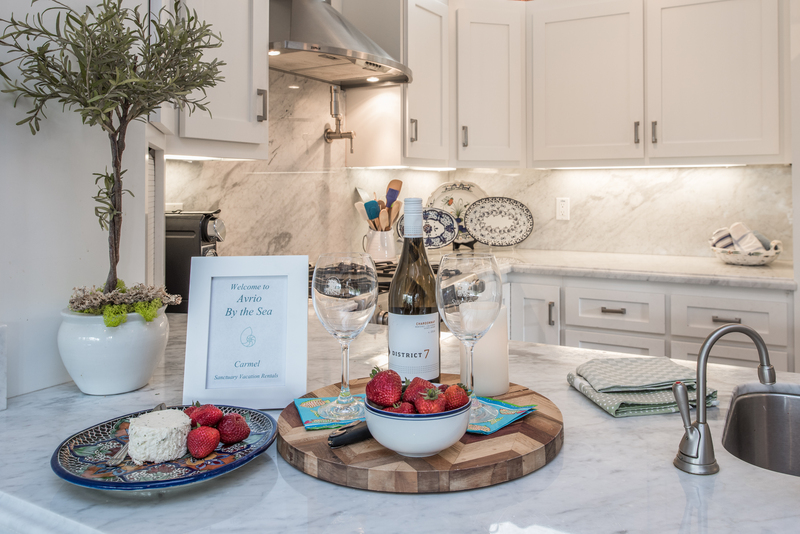 Upon your arrival you will be greeted with complimentary hors d’oeuvres and wine or sparkling cider, tickets for a wine tasting at Scheid Vineyards’ tasting room in downtown Carmel-by-the-Sea and a basket of local information. An assigned concierge vacation house manager is available to assist you during your stay. We have also provided spa amenities in the bathrooms, spa robes and beach gear. A vine-covered arch is the entry to a curved walkway that leads to a flagstone patio that surrounds the front door. 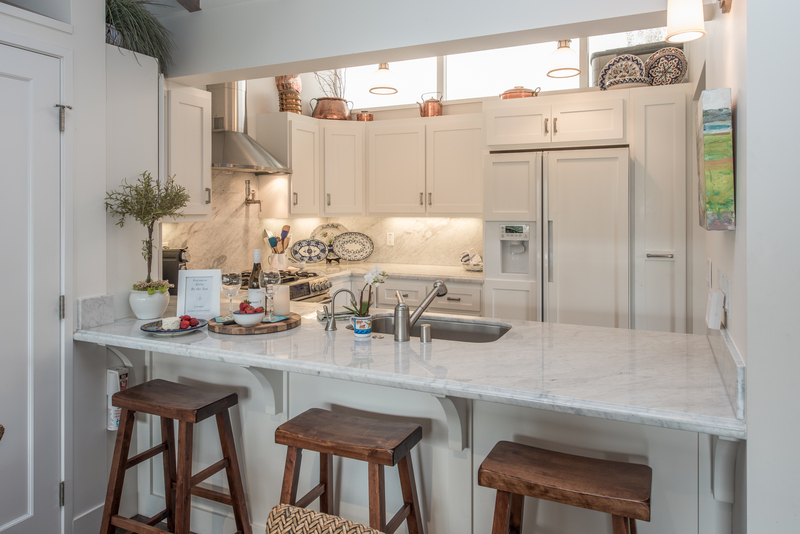 The sheltered patio, which has a built-in bar with sink, generous seating and a gourmet gas grill, features heaters so that the space can be enjoyed year-round. A special sliding door can be opened so that it’s easy to move between the kitchen and the patio, bringing the outdoors inside. The front door opens into the upper level, which includes an open floor plan with kitchen, dining area and living room, ideal for entertaining. 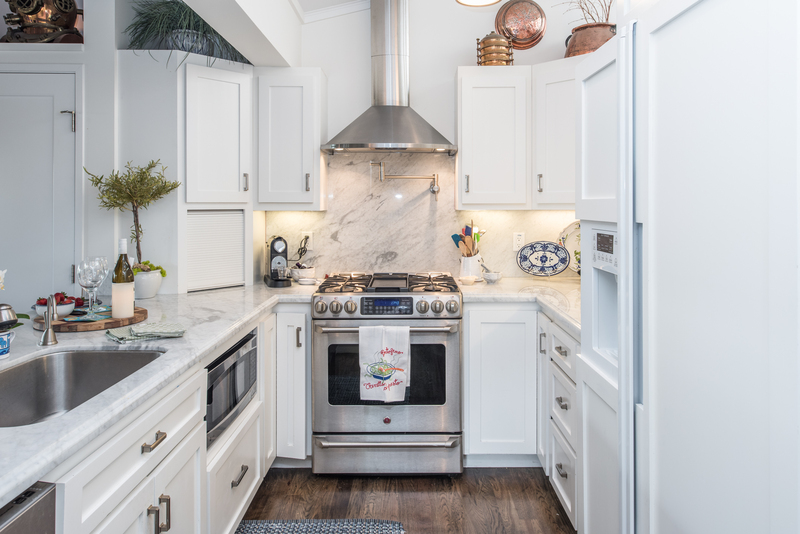 The fully equipped kitchen includes a four-burner gas stove with built-in griddle, built-in water spigot above the stove, stainless steel appliances, and marble countertops and backsplash. Seating for three is available at the kitchen counter. 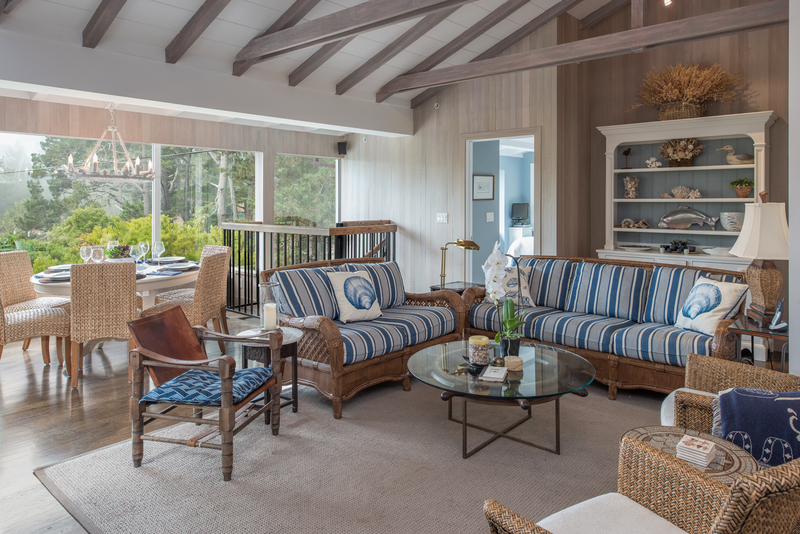 The adjacent living room with an open beam ceiling offers comfortable upholstered furniture around a gas fireplace with marble surround, a perfect spot for conversation, playing games or watching the 40-inch HDTV. A bar area is available next to the dining room table, which seats six. Also on this floor is the master bedroom, with a queen bed, a built-in writing desk, 32-inch HDTV and large west-facing windows. 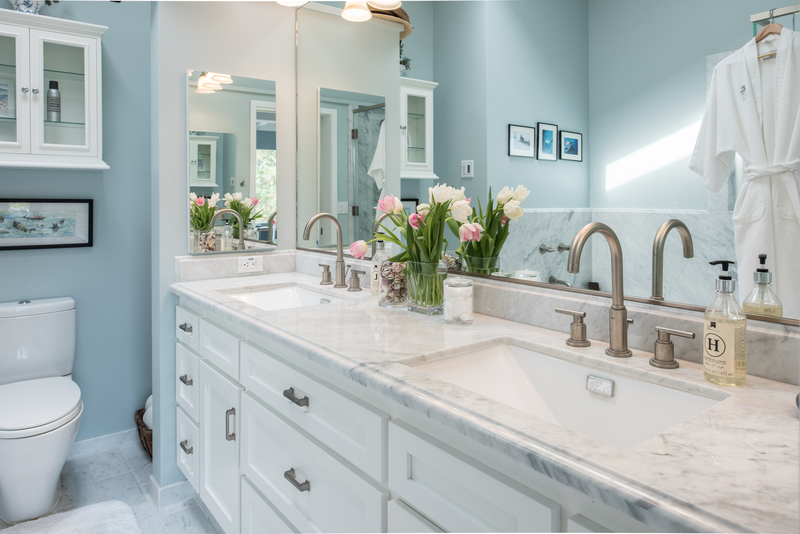 The master bathroom features marble countertops and floors, dual sinks, a deep tub, and separate shower with dual showerheads and pebbled floor. A second bedroom includes a queen bed, built-in writing desk and 28-inch HDTV, with adjacent bath with marble countertops and flooring and a shower. This room has a private patio with bistro seating. A spiral staircase leads to the lower level, where a bonus room offers a 28-inch HDTV, DVD player and DVD library, a writing area and queen sleeper sofa. Next to this is a bunk room with 4 twin beds that can sleep four, a bathroom that includes a shower and heated floors, and a bedroom with queen bed and 28-inch HDTV. A gated outdoor corridor leads to a convenient outdoor shower. Three designated parking spaces are available. If you are booking for a last minute stay, ask our Reservationist if there is a Last Minute Special available. Last Minute Specials typically exclude holidays, special events and the summer season; specials cannot be combined; other exclusions may apply. Please call for details. * Weekly stays may be available 30 nights prior to arrival and are subject to 10.5% tax. * Holidays & Special Events may have higher rates. * Housekeeping, Processing and Property Protection fees and taxes are additional to the base rates. * Guest stays of 30 days or more will also be responsible for utility charges (Electricity, Gas and Water), mid stay cleaning fees and a security deposit. * Rates are subject to change and Owner approval. 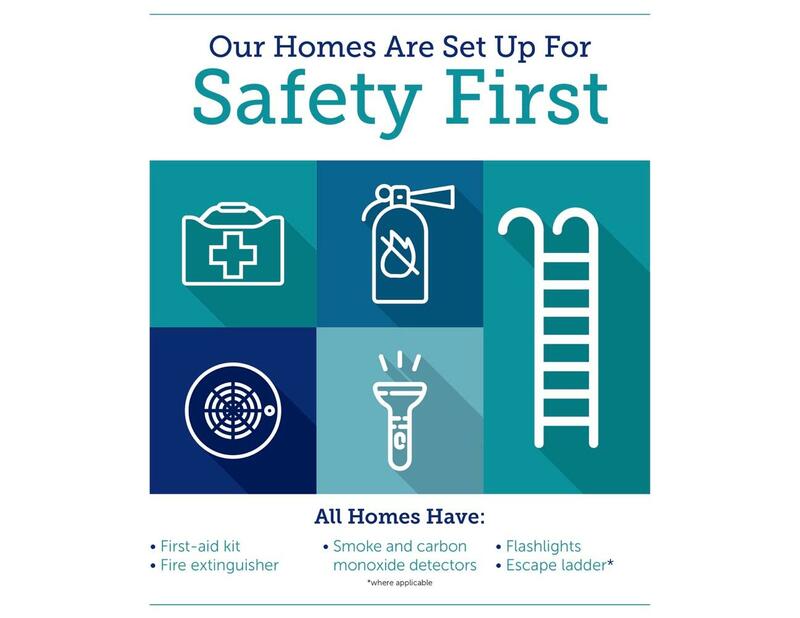 * Total occupancy may affect rates: Rates may vary depending upon how many guests are occupying the home, including all infants and children. Guests stayed in april 2018 ~ Reviewed on Homeaway ~ 5 out of 5 Stars! "Out of this world! This house is flawless, a real gem! Set in the trees with views of the sea, the attention to detail is astonishing. The rooms are all dressed beautifully & to such a high spec but also with every home comfort needed. The outdoor space makes the evenings even more enjoyable! 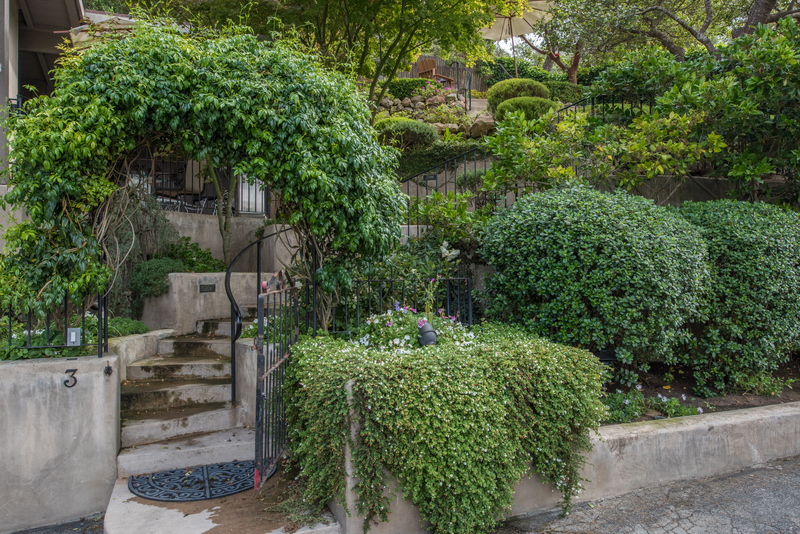 Walkable to town & the beach, at the end of a quiet private street, the location is perfect! We would happily stay here again!!" Guests stayed in december 2017 ~ Reviewed on Homeaway ~ 5 out of 5 Stars! "Felt like home...but better! Our family enjoyed Avrio By the Sea as our "home base" for exploring the surrounding areas. We've stayed in many rentals in many locations, but this one was extra special. You could tell it was well cared for by the owner and manager..it felt like a home not a rental. It was so relaxing, we skipped a few of our well-made plans for "must-sees" to enjoy hanging out and enjoying a simple walk to the beach, downtown, and back." "I recently stayed in the Riedel house. It was attractive, comfortable, well stocked, and convenient I would definitely recommend it." Guests stayed in november 2016 ~ Reviewed on Homeaway ~ 5 out of 5 Stars! "Beautiful Home! 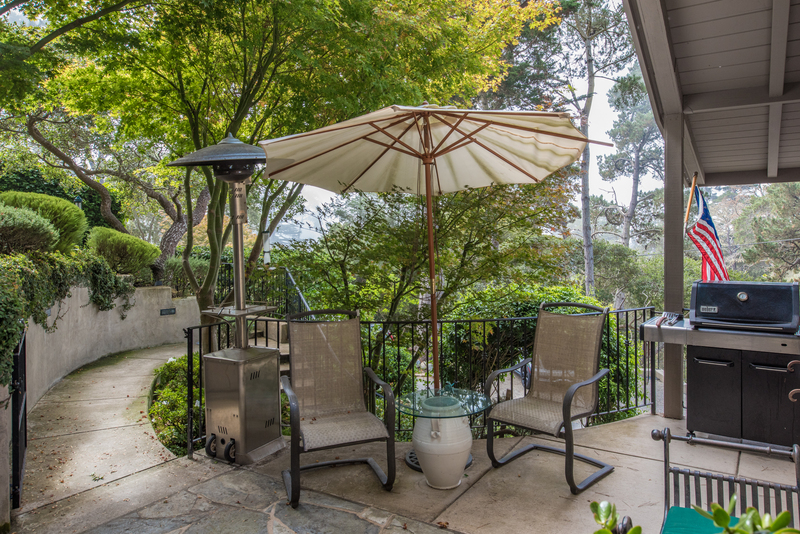 This is a beautiful private home within walking distance to the beach and downtown Carmel. 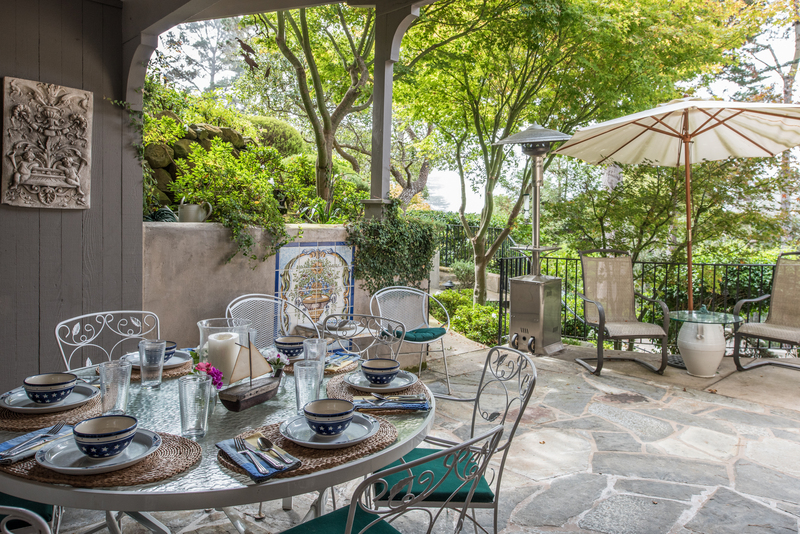 The outdoor patio and gardens are wonderful places to sit and relax. The house was recently renovated and the kitchen is fully equipped. Additionally, there are three private parking spaces in front of the house." Guests stayed in october 2016 ~ Reviewed on Homeaway ~ 5 out of 5 Stars! "Delightful stay! This property was very tastefully furnished and decorated. The rental staff cordially assisted at every turn. The very nice property is located within walking distance to the central business district. All in all we had a memorable stay. We will definitely return." Maximum occupancy: Home sleeps up to 8 adults and 2 children age 12 or under. Note: Master bedroom has a small TV, large built in desk and an en suite bathroom with soaking tub, separate shower and dual sinks. 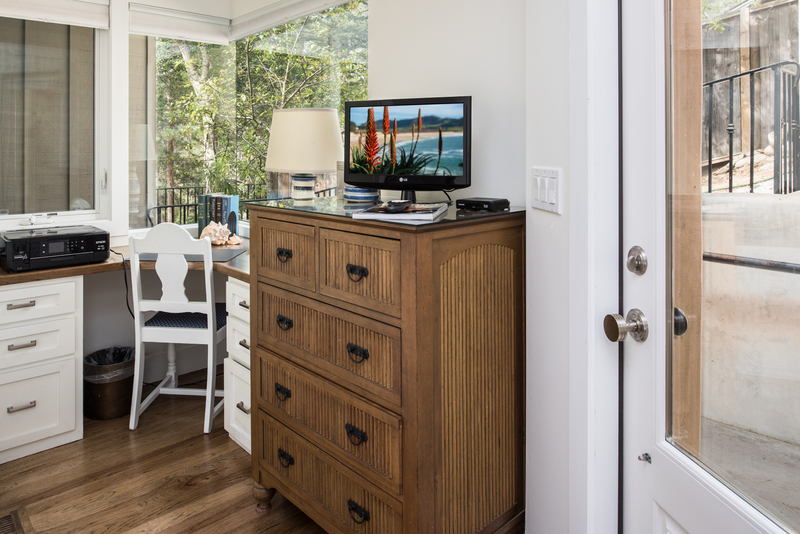 Note: This bedroom has a small TV a desk and direct access to the hall bathroom with a standing shower. 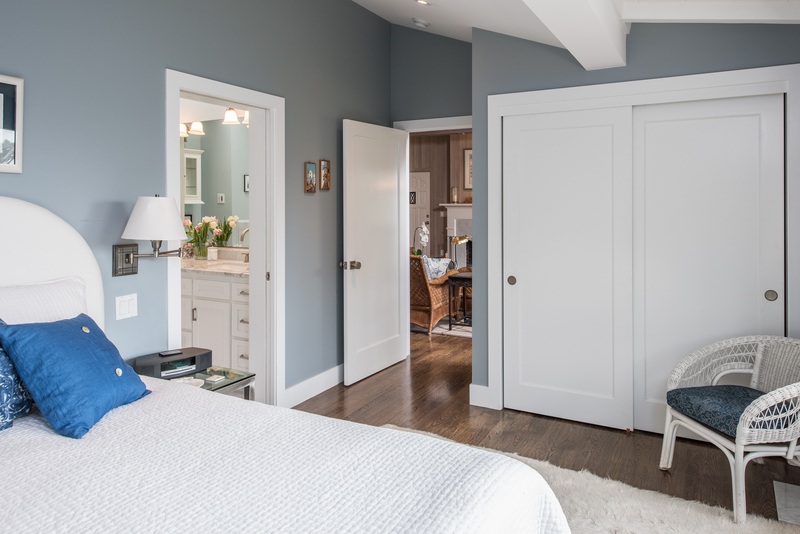 The bedroom also has a separate entrance leading to a small patio and down to the outdoor shower and parking area. Note: This bedroom has direct access to a shared Jack and Jill style bathroom with a standing shower, a small TV and a separate entrance leading outside to the parking area. Note: Note: This bedroom has direct access to a shared Jack and Jill style bathroom with a standing shower as well as an en suite sink and vanity and a small TV. Note: This room has a small TV, DVD player, desk and a separate entrance leading outside to the outdoor shower and the parking area. The bathroom on this level is accessed via either bedroom #3 or Bedroom #4 and there is a bathroom upstairs with hall access that is shared with bedroom #2.